FOR MY SUMMER VIEWING SELECTION our producer, Lee Barber, asked me to choose some of my favourite CLGdotTV programmes of the last few months. Vacation, staycation or nocation you may need to catch up on some of the key LocalGov conversations that passed you by earlier in the year. My short list got longer and longer but I make no apology. CLGdotTV aims to broadcast discussions by experts, on key issues in Local Government, with the minimum amount of jargon and grandstanding. Do we always get it right? No! But when we do it's compelling stuff. I hope you enjoy viewing these programmes as much as we have enjoyed making them. Arts, culture and place: playwright David Edgar & Coventry City of Culture creative director Chenine Bhathena https://bit.ly/2MCW7OB ; and author Stella Duffy with Darren Henley CX of the Arts Council https://bit.ly/2Mg196S . These two videos remind us that local government is not just about collecting the bins, managing local development and supporting vulnerable people. It is also about inspiring and leading the experience of place for the benefit and wider wellbeing of local residents. Open data and elections: with LGiU’s Ingrid Koehler & LGA’s Juliet Whitworth https://bit.ly/2KF0Hdo ; also Democracy Counts’ Simon Verdon & Keith Simmons, Chief Officer (Democratic & Registration) at Bedford Council https://bit.ly/2KEZWB4 . We used the opportunity of May’s local elections to examine why people don’t participate as fully in local elections as they do in national ones, despite the huge impact of local services and the local economy on their lives. Greater openness and transparency, and what is needed to make it happen, are central to both discussions. The circular economy: not just waste recycling, also local procurement of suppliers with David Greenfield of SOENECS & Hilary Simpson https://bit.ly/2Jar4HK and Hilary again with Dan Sofer & Matt Crow on the cooperative effect in Preston & Islington https://bit.ly/2IJMFau . Both discussions were about making best use of resources. Waste management is increasingly about reversing decades of ‘the throwaway society’ while it can also be argued that local resourcing of technology and other suppliers is ultimately less ‘wasteful’ – of human rather than physical resources. Making websites accessible: back in February I spoke with Colin Stenning of Bracknell Forest Council about the challenges of making websites accessible to people with disabilities. Bracknell Forest has been a consistently high performer in accessibility testing by Socitm’s Better Connected service. Colin explained that it isn't enough for web developers and content editors to have the right skills and knowledge. Awareness of the need for accessible websites among budget holders is essential too. 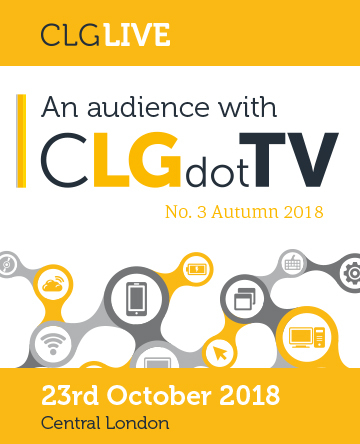 The data dividend for councils: since CLGdot TV started, we’ve had a lot of conversations about the value and uses of data collected by councils, but this was one of the first. Here Lars Malmqvist of Arcus Global; Tom Symons of Nesta; and Pye Nyunt of LB Barking & Dagenham share their knowledge. Service Design: this programme, recorded in front of a live audience on 27th June at the second of our ‘Audience With CLGdotTV’ days has been one of our most popular. Also featuring Ingrid Koehler, who heads service innovation at the LGiU, panelists include Ben Lyons-Grose Head of Service Design at Methods & Natasha Epstein Environmental Services Contract Manager at South London Waste Partnership. Nobody wants to live in a care home: this is one of the most viewed videos from a clutch we made at the TechSevern event with support from West Midlands ADASS. Carey Bloomer of Marches Care and Lynne Bowers, a workforce specialist working with IEWM and WM ADASS shared their ideas in an extremely interesting discussion about the need to change widely-held attitudes to social care among the general population. In future, only those with extreme mental and physical incapacity are likely to be accommodated in care homes and everyone needs to engage with the realities of responsibility for their own care and that of other family members. PODCAST: Quality Assurance for Care Homes: the weight of regulation and the frequency of changes in procedures and technologies can make compliance and its monitoring a bottomless recource pit. Heath Groves explains to Joe Tibbetts how Sundown Solutions, have been working with Rochdale Council to develop an online service that ensures are compliant but even better, shares improvements among the user community. What does the future hold for local government: Graeme McDonald MD of SOLACE and Andrew Haldenby Director of REFORM agreed that the shift towards greater autonomy and greater control of local budgets for local government is becalmed – maybe never really having got started in the first place. A couple of weeks’ later, Joe spoke to Martin Reeves CEO Coventry and SOLACE lead on LG finance gave us more details about the crisis in local government finance, and did not pull any punches. The case for de-criminalising cannabis: Neil Woods is a former policeman, a member of the drug squad, who spent years undercover in drugs gangs, JS Rafaeli is an author and broadcaster who has made a special study of the drugs problem and the criminal environment that surrounds it and Paul North now works in drugs policy having started in the front line as a drugs worker make the case.